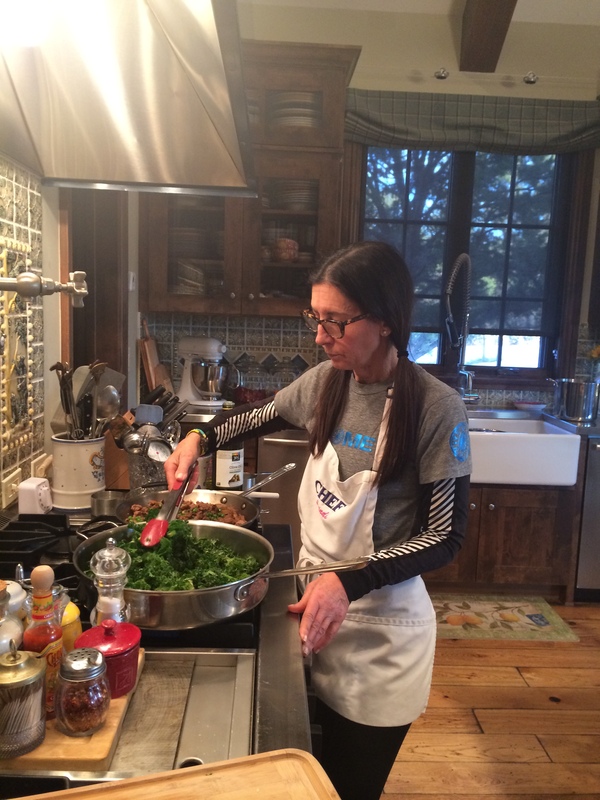 Our daughter Kerri is out visiting in Colorado and it’s a great opportunity not only to ski with her and enjoy our time together but to cook vegetarian style for her. I have been saving this one for her because we all know what a waste this would be for just Joel. I made Joel a separate Bowties Pasta with Turkey Sausage, Peas and Mushrooms which if you have never made you really must check out, it’s on my blog under that title originally posted on July ’11. (see in photo) I used a Fusilli type short pasta which was perfect. This dish really was so super easy to put together and it will now become one of my go-to pasta dishes for sure. I was also able to buy the Kale from Whole Foods chopped and cleaned already, which only made the prep that much easier . 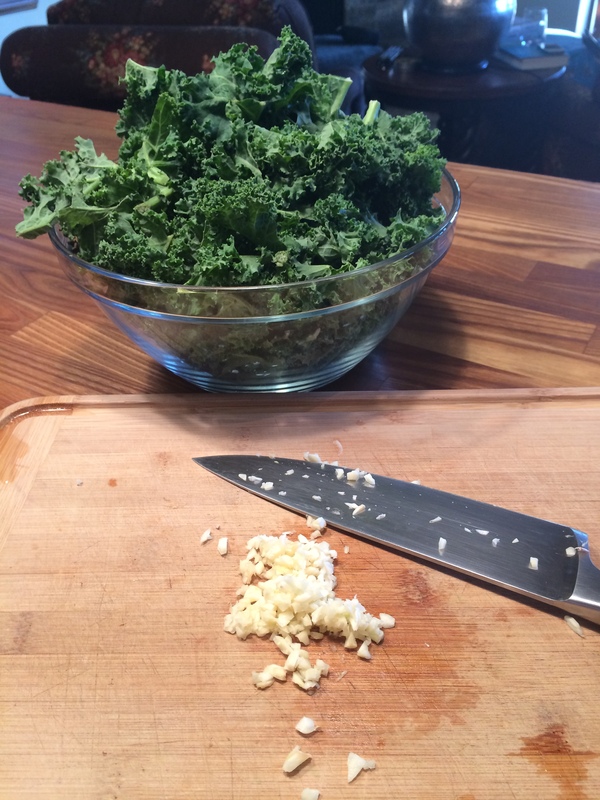 I would say total prep even if you have to chop and clean kale would only be 20 minutes . Super healthy and the kale turned a beautiful shade of deep green and the flavor is amazing. I of course added a little crushed red pepper , just 1/4 teaspoon which is enough for a bit of heat but not too much at all. You can moderate this to your own taste. 1 bunch of Kale , I bought a bag of cleaned , chopped Kale and it was perfect. I used one bag of chopped and cleaned Kale. 1 box (1 lb.) short pasta like fusilli , I used DeCecco brand Fusilli Corti Bucatini which worked out beautifully. Any short macaroni will do. Cook pasta according to box directions for al dente. Make sure you reserve 1 cup of pasta water before you drain pasta. Start to boil water as you prepare the kale. Prepare the Kale if you can’t find the chopped and cleaned version. 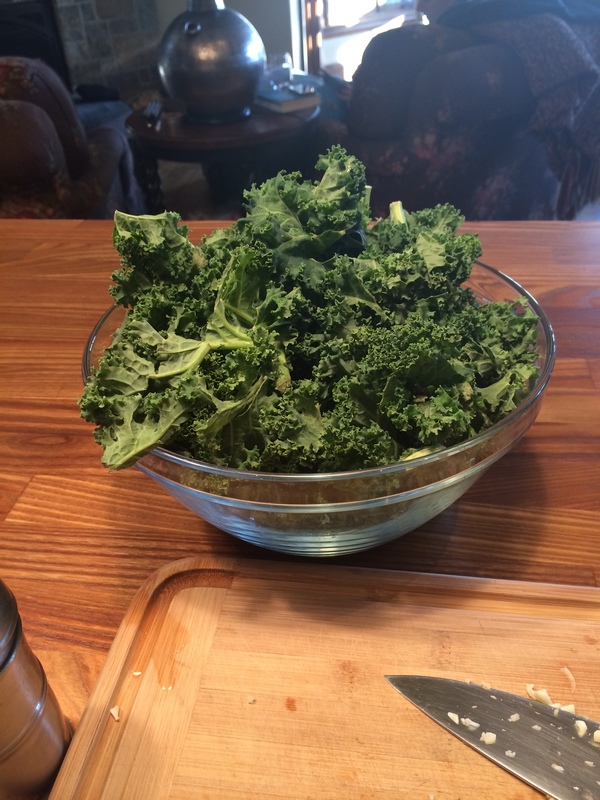 Pull the kale leaves from the stems, discard the hard stems and tear the leaves into small pieces. Wash Kale. A salad spinner is perfect for this task. 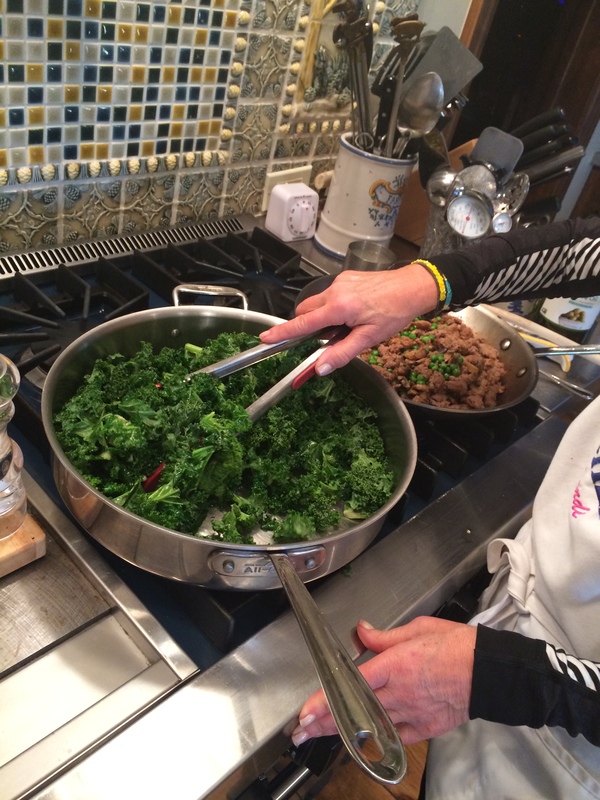 Add the 2 tablespoons of olive oil to a large skillet type pot, large enough to hold and cook all of kale. Heat oil till it shimmers for a few minutes. Add the garlic and cook for 1/2 minute. 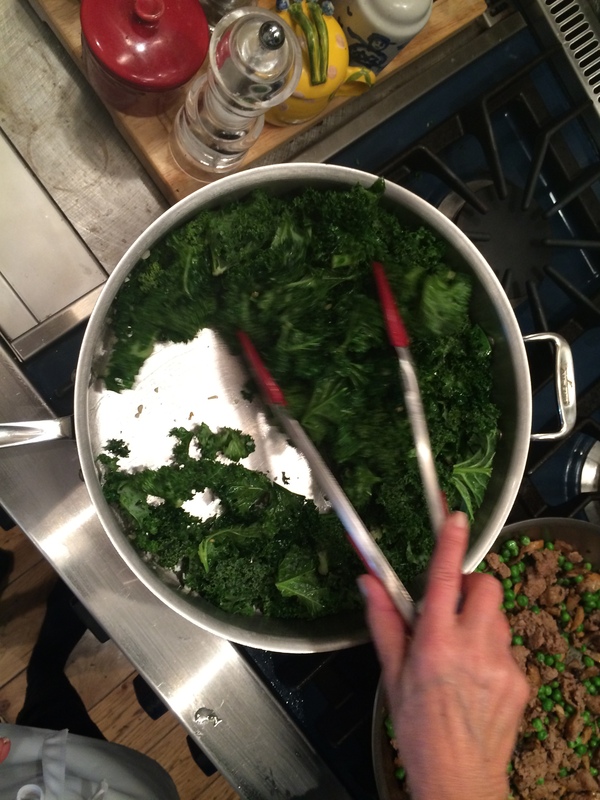 Add the kale and toss with tongs if you have them coating the kale with the oil and garlic as you go. Then add the 1/2 cup of water, cover and cook , stirring a few times and cooking the kale until it is tender 7-10 minutes. Stir in the salt, pepper and crushed red pepper. Remove from the heat. Your pasta should be ready by now and you should have your reserved cup of pasta water handy. Drain the pasta. 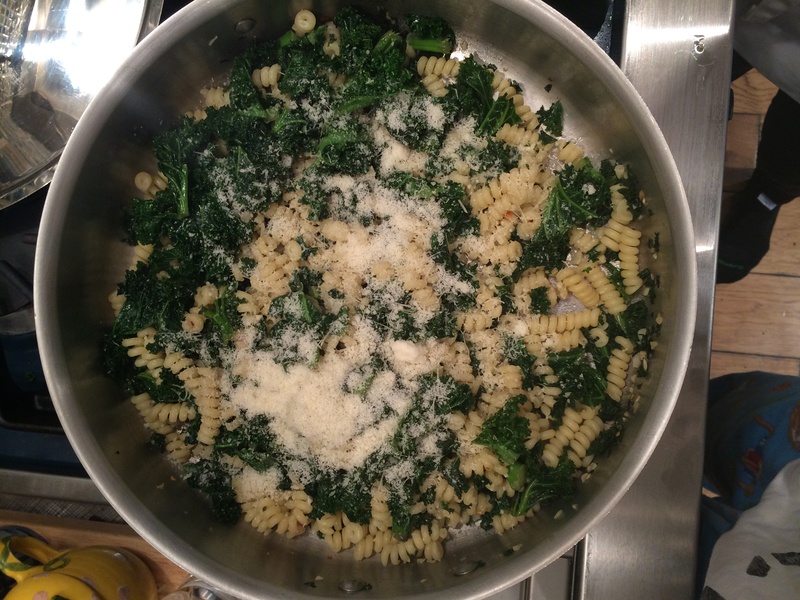 Add the pasta to the kale in the pan you were using and turn the heat on to a medium heat. Add about 3/4 cup of the reserved pasta water. Bring to a low simmer, add the parmesan cheese and stir, using a wooden spoon to mix till cheese melts and coats the pasta. If you need a little more liquid you can use the little bit of pasta water left. Keep stirring until it’s nice and creamy. Stir in the remaining tablespoon of olive oil. Taste for Salt and Pepper. Mine was perfect . Serve with a fresh hunk of Parmesan Cheese for grating in a little extra and a little more crushed red pepper. 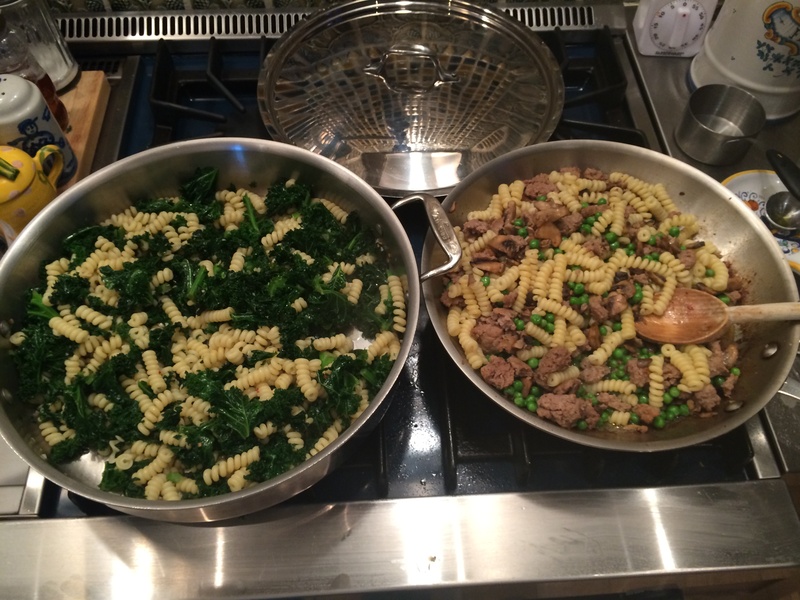 This entry was posted in meatless, pasta and tagged Kale and Pasta, Kale and Pasta Perfection, Vegetarian Kale and Pasta, Vegetarian Pasta. Bookmark the permalink. this makes me so very happy !!!!!! thanks for the note and and keep on cooking with candi!!! !